I am am also reviewing and giving away some excellent Beko products over the next few months. 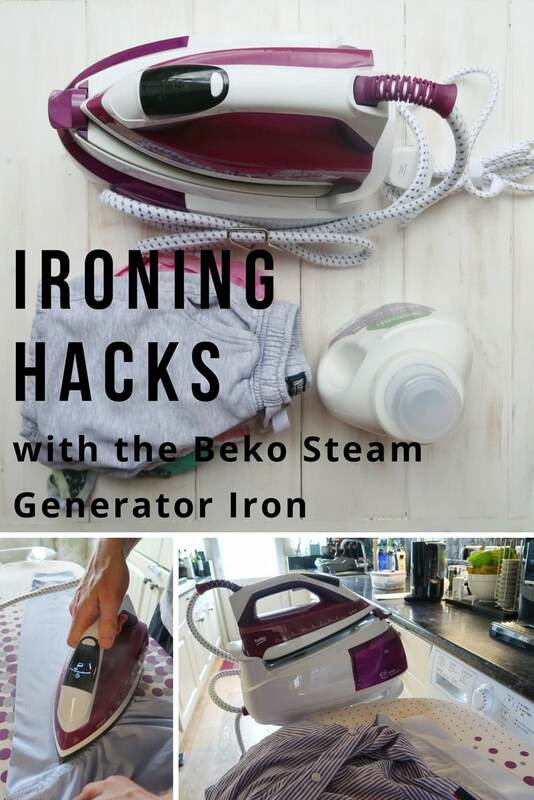 Make sure to check out our review of the Beko 2600w Steam Generator Station below the ironing hacks. In addition, check back next week when I will be giving one away. 1. Do not overload your washing machine. The clothes have more room to move around and get less crumpled. 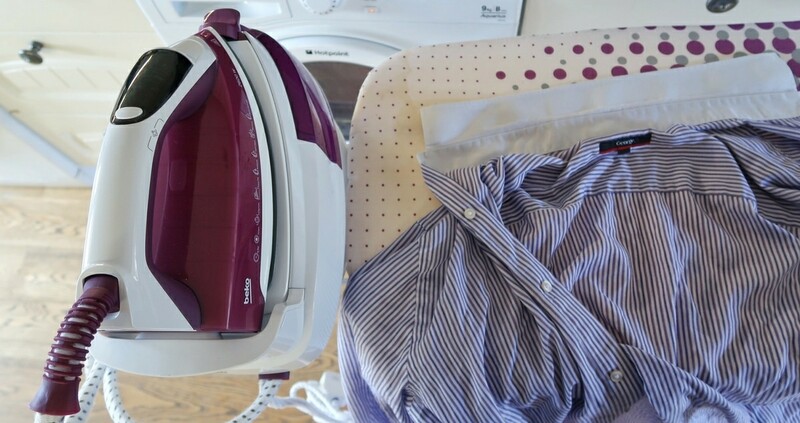 If you then hang them up or iron them as soon as you take them out, they should need minimal ironing. 2. If you use a rolled up towel and insert into the sleeves of shirts and blouses, you can press them without leaving creases where they are flattened. 4. Think about the order you iron things. 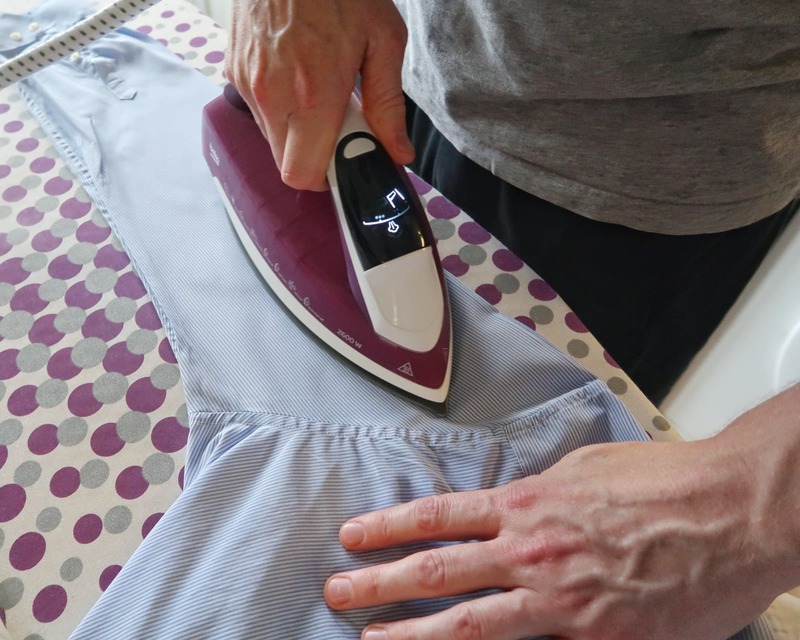 If there are some tricky items that you know will take the longest, iron those first so that the easier items are at the end. Alternatively, if you have a mixed bunch of delicate items and items that require high heat, iron the low heat items first and move through to the items that require high heat. 5. (Courtesy of my husband) If you wear suits to work and have to iron shirts, you may not have to iron the whole shirt. The front and collar are the most important bits and if you are going to be wearing a suit jacket most of the time, you can get away with just ironing those. 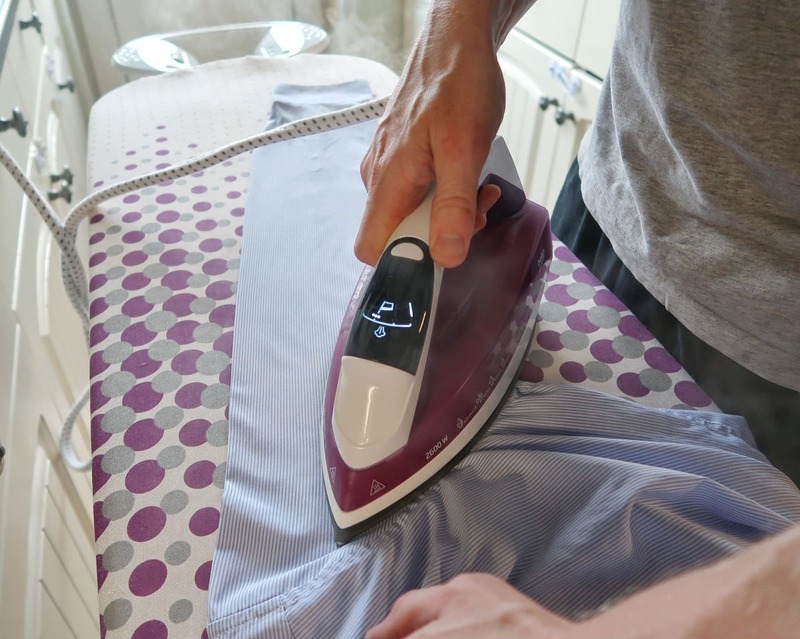 If the worse happens and you do have to iron, having a really efficient machine is one of the greatest ironing hacks to help you get through it with minimum time and boredom. Beko sent us their Steam Generator Iron to try and I would not go back to using a traditional iron. The Beko Steam Station can set the optimum steam and temperature settings for every fabric. It also has something called SteamXtra™ technology, meaning even the most stubborn of creases will be ironed out, while ensuring your laundry is protected too. This method sends jets of steam into your clothes at different angles, removing creases while being kinder to fabrics. The iron works really well. 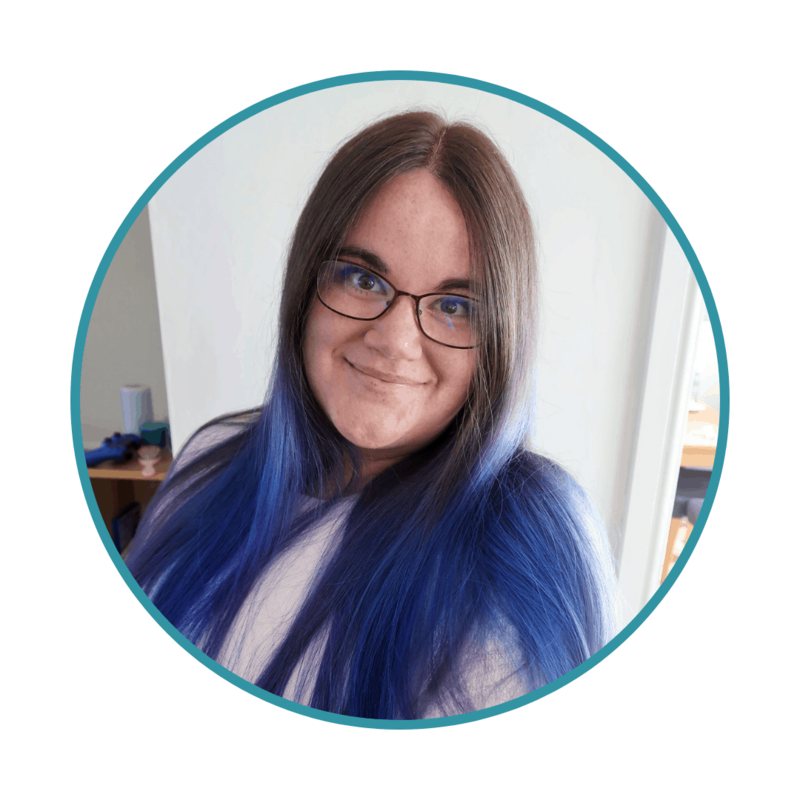 It steams continuously, meaning it deals with creases much more easily, but the separate unit means it does not need to be refilled as constantly. It is lightweight and compact, even for a steam generator iron. My mum runs gites in France and has to iron a lot of bed linen, tablecloths and towels for her guests. She has a steam generator iron to cope with the industrial scale of ironing needed but it is much heavier, bulkier and more noisy than the Beko model. Having used both, there is not a great deal of difference between the results – but the Beko is much easier to use and weighs half as much. It is also pretty much silent. The iron is small enough to sit on the usual iron space on the ironing board. 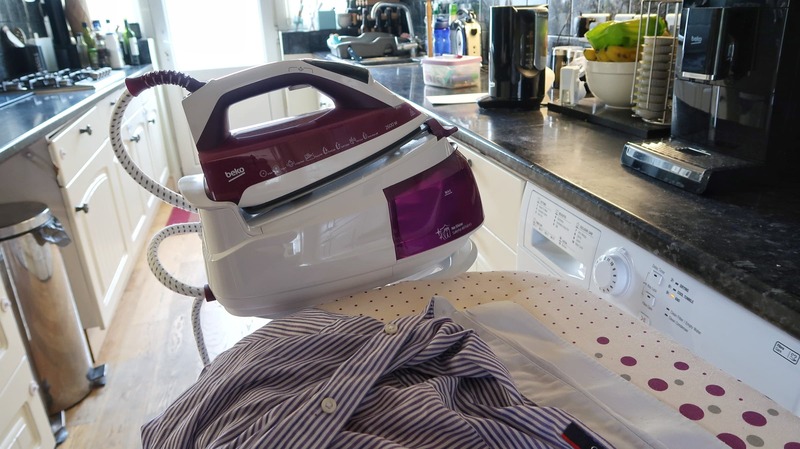 However, the unit is also very manoeuvrable, meaning that it is more versatile as you can place it on other surfaces and move around more, making larger items much easier to iron. The digital display that tells you useful information like when to refill and when to descale. 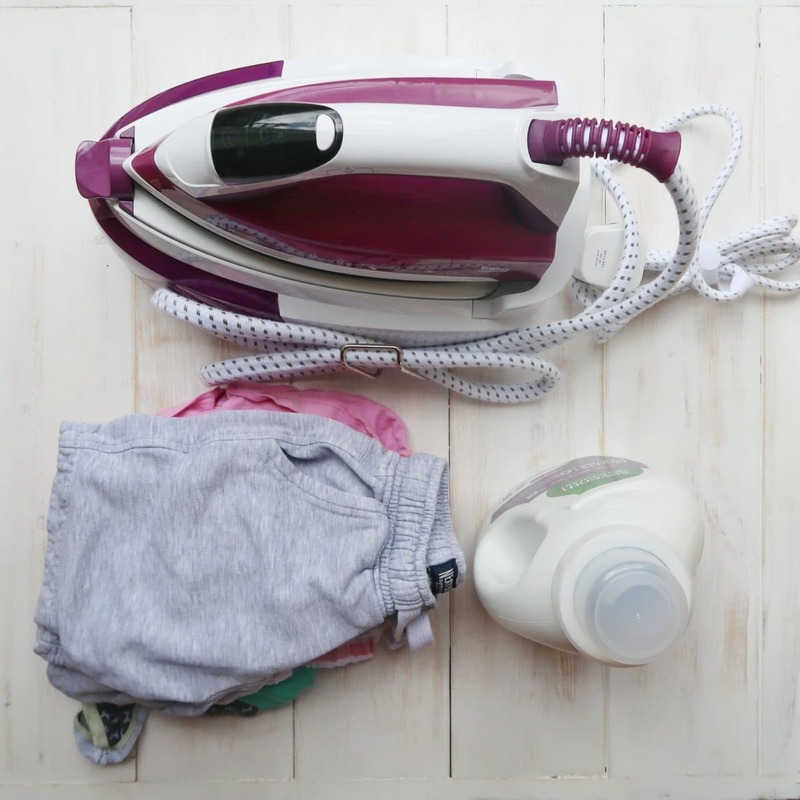 The iron fits into the base unit and has a little swivel button that locks the iron in place – so there is no chance it can fall off or be pulled of the base unit if it is locked in. It is still bigger than a traditional iron. You will have to make more space in the cupboard! The tubes and wires are quite large and can get in the way a little. There is a helpful metal holder on the side to help organise the tube that the steam comes through. However, it is bigger than a traditional iron’s cord and gets in the way a little more. Overall, we recommend the Beko Steam Generator highly. If you are ironing large items often, like my mum, I would say it is a must-have. Although I am never going to love ironing, the Beko Stream Generator certainly makes me more likely to do it. Next week I will be giving away a Beko Steam Generator Station to one lucky reader, so make sure to check back soon. Please not, this post is in collaboration with Beko. In our role as ambassadors, Beko kindly send us their products to review and give away. Thanks for the review, I could do with a new iron and this sounds like it would be perfect for my needs. My wife LOVES ironing and wears out an iron in a year! I think she needs one of these! Love the tip about the bedsheets, I’ll be trying this! If you do up the top button when you wash jeans, the bum keeps its shape. My top tip is to get hubby to do the ironing. Mine loves ironing. Veru useful tips indeed. I like #5, I guess my husband will have to settle for a few half ironed shirts when I’m pressed for time in the future.